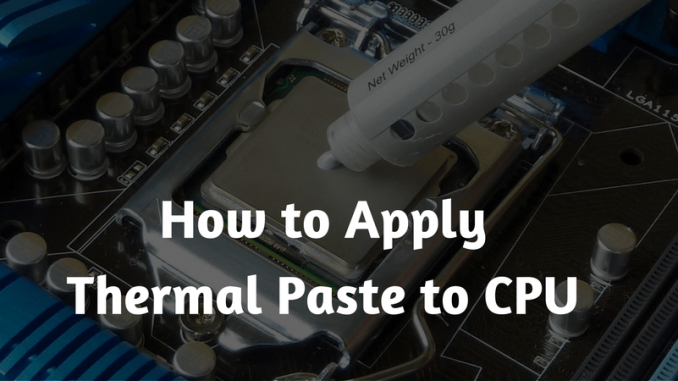 Here in this article, I am going to give you the answer to an important question: ‘How to apply thermal paste to CPU?’ People have a lot of queries regarding this matter as it is a highly important part of the computer system. As we all know that the processor is a small and delicate, but the most expensive part, and so needs a good caring. A thermal grease is a heat transferring agent and necessary for your CPU cooling. It prevents overheating. But, if it has been applied in some inappropriate manner, it can crash your system or drop its performance. Professionals prefer a thermal paste which includes the combination of zinc oxide and silicon. Cotton buds damped with Isopropyl Alcohol. 70% solution is enough, but it will get the better result if the percentage is higher in the solution. After collecting all the needed things, first of all, you have to unscrew the back cover of your CPU. If you have a laptop, make sure that you dismantle the back cover properly with the screwdriver. After that, remove the CPU fan and heatsink and dip your cotton in Isopropyl Alcohol. All professionals are suggesting Isopropyl as it has better cleaning capacities and fast drying. Note: If you don’t want to use this solution, then you can also use high concentrated Ethyl or Methyl alcohol. If you can’t find Isopropyl alcohol, you should go to the printer’s shop as this kind of solution is used in such stores. Now, take that cotton swab and clean the CPU fan. You can insert the swab and softly remove the dust. Removing dust is an important task. Repeat it until you feel that the fan is now dust-free. Also, clean the heatsink surface. If you have a new laptop or CPU, then you don’t need to clear the pre-applied thermal paste, but if you have older CPU, clean over the old thermal compound applied before. Lightly rub the wet cotton above the area where you want to apply the fresh thermal compound. After all the cleaning procedures, now it is time to implement the thermal paste. Many people have a question in their mind regarding the quantity of the grease. There are many techniques by which you will get to know how much thermal solution to apply for the CPU cooling. Smoothly / Roughly spread across the CPU, etc. You can apply the paste by using the injection tube or directly from the tube bottle. Spread the thermal compound by using the plastic card. If you want, you can spread it by your fingertips. Just do not forget to use hand gloves! Note: You have to apply the thermal compound evenly. There should be no gaps or bubbles during the thermal grease spread. Step 5: Rearrange the heatsink and fan. Step 6: Test your laptop or CPU and save it from overheating. So, these are the steps to apply the thermal compound. Our research shows that ‘the X shape’ technique gives the best performance and can avoid the majority of bubbles/gaps. Moreover, you should always use the high quality thermal paste available in the market even if it is costly as heat management is essential for better performance of your computer.